Download Firefox 3.5 Final for Windows from Fileforum now. For a good part of Tuesday, the Web Standards Project's Acid3 testing server was offline. With it went 25% of our browser performance testing capacity, which kept us from being able to publish our initial Mozilla Firefox 3.5 performance index as originally planned. As Acid3 started coming back, browsers were posting curiously low scores (for instance, Opera 10 Beta below 100%) that led us to dispute the test more than the browser. Today, however, with the server back online, we're able to give a reliable performance estimate for the first fully stable edition of Firefox 3.5. Earlier this week, some of our readers advised us that 3.5 RC3 would be bit-for-bit identical with the final 3.5, so the scores should come out the same. And if they don't, then something must be wrong with us. No, that's not correct. Many of the scores contributing to our benchmarks, such as individual heats in the SunSpider test, were indeed either the same or within 0.5 ms of the RC3 score. But some of the advances we saw in the final private builds, particularly in DOM handling and regular expression (RegEx) parsing, did carry over into the final 3.5 build after all, for big gains in those departments specifically. That's the thing about speed test profiling: We can see where things change and where they don't. 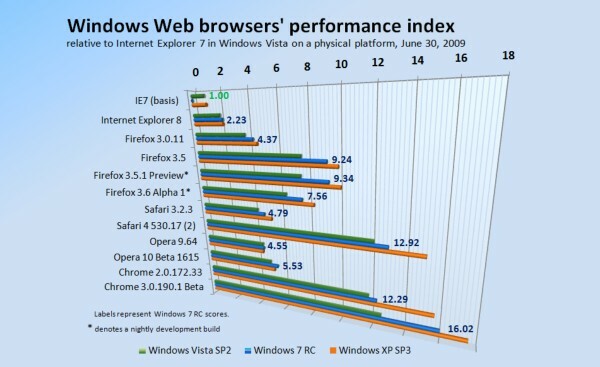 As a result, Firefox 3.5 posted a 9.93 in our performance index on Windows XP SP3. What that means is, this latest browser generally performs nearly ten times better on XP than Microsoft Internet Explorer 7 (the previous version, not IE8) on Vista SP2, which is about the slowest browser you can run (and therefore the one we chose for our index). Similar gains in the same departments were recorded for Vista and for Windows 7 RC. Vista still slows down the browser (any browser) noticeably, making it post a 7.61 index score. While Windows 7 is still a slower platform than XP, it's not nearly the bear that Vista has been: Firefox 3.5 scores a 9.24 in Win7 RC. In terms of speed alone, the new Firefox runs 29% faster in Win7 RC than Vista SP2, and 41% faster in XP SP3 than Vista SP2. On average (taking into account some new and welcome speed gains in the latest Opera 10 Beta), Web browsers run 20% faster in Windows 7 RC than in Vista SP2. Comparing the new Firefox to the one folks were running just last week, by Betanews estimates, version 3.5 runs at 253.8% the speed of version 3.0.11 in Windows XP SP3, 246.5% the older version's speed in Vista SP2, and 254.6% the speed in Windows 7 RC. That averages out to about 251% the older version's performance across the board. Yesterday's release of Firefox 3.5 means that the "Shiretoko" development track, which Mozilla reserves for whatever "the next version" may be, is now devoted to whatever improvements are to be incorporated in the first bug fix release, to be called version 3.5.1. There's no release date or even a forecast for this, because there just aren't that many bugs yet. But we are seeing minor performance improvements in the Shiretoko track over 3.5, including a 9.34 index score for Win7. Download Firefox 3.5 Final for Linux from Fileforum now.